When you want something done, ask a busy person. 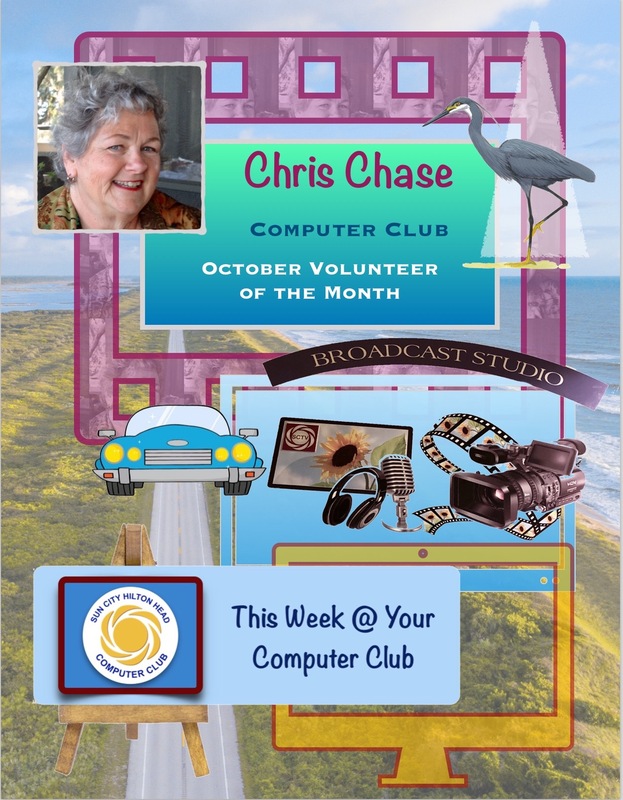 This certainly describes our October Volunteer of the Month, Chris Chase. Volunteering behind the scenes for the past three years, Chris is responsible for our weekly email communications, ”This Week @Your Computer Club”. We can plan our Club activities each week thanks to Chris’s Sunday email. Chris belongs to several clubs in Sun City; is a reporter for Sun City TV News and for the Sun City TV show “In Our Neighborhood”. She attends the Church of the Cross serving as a monthly greeter and hosts coffee after services. She also volunteers at God’s Goods Thrift Store on Tuesday afternoons. Please go by and say hello to her! Chris’s hometown is Syracuse, NY. She and her husband, Sam, have lived in Washington DC, Richmond VA and then in Atlanta, GA where she had a Medical and Dental billing business for almost 20 years. Upon reaching that magical age, Chris and her husband, moved to Sun City, living on the south side for 7 years, and then relocating to the north side to Heron’s Pointe 3 years ago. Chris served as their Social Chair for the first 2 years and currently is the Alternate Rep. They have 4 children, 23 grandchildren, and 11 great-grandchildren. Two of her daughters live locally, another daughter lives in Virginia and her son lives in San Antonio. They see all 4 families often and their home here is always jumping with the grandchildren. 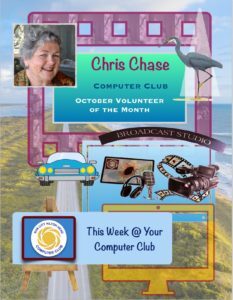 Whether in front of the camera as a reporter for Sun City TV or behind the scenes in the Computer Club, Chris is one active lady. 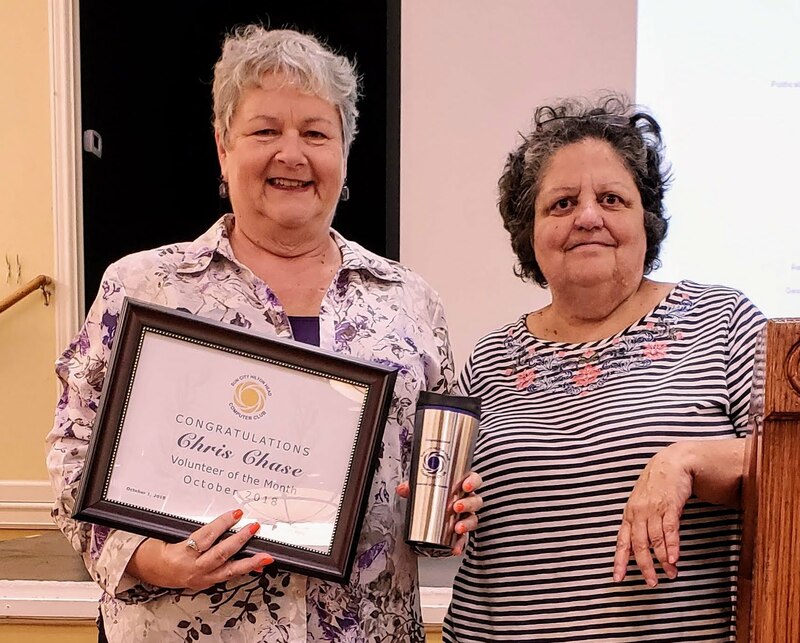 She was nominated for Volunteer of the Month by Debbie Dennis, Education Chairperson. Debbie says Chris’s willingness to try new things and her positiveness are a couple of traits she admires most. Debbie knows she can rely on her to get the job done no matter what. (Debbie also enjoys being Chris’s Facebook friend and reading the funny things she shares).